A theme park in northern China offered free entry tickets this week to women if they weighed over nine and a half stone (61.8kg), it’s reported. According to the China Daily newspaper, the Tang Paradise park in the northern city of Xi’an granted hundreds of women free entry from 15-19 June if they were heavier than a Tang Dynasty imperial concubine. It says that the Tang Dynasty-themed park had chosen 61.8kg as this was the approximate weight of Yang Guifei, an eighth century consort and one of China’s “four great beauties”. The promotion highlighted that being “slightly overweight” was a beauty standard during the ancient dynasty (618-907 AD). 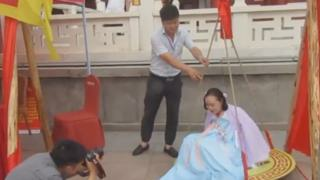 Female visitors tested whether they were eligible for a free ticket by sitting in a giant weighing scale, and those who were heavier were also entered into a competition to see if they could win the title “Beauty of the Tang Dynasty”. Over five million social media users have watched video footage of visitors weighing in via the BTime broadcaster. It has ignited thousands of comments on the popular Sina Weibo microblog, and users are incredulous at the promotion. Some joke that they are heavy enough to attend, but others are more critical. “You are discriminating against thin people,” one user says. “What about men?” another asks. This is not the first time a Chinese promotion based on someone’s weight has ignited online debate. In December 2014, a restaurant in southwest China offered discounts to men who were overweight, and women who were underweight. “Fat lady” pottery flourished and was popular during the mid eighth century.